So Simon and I have moved from London! I’ve been talking about the big move up North for a while on my blog and we’re finally back in Newcastle where I grew up. At the moment we’re living with my mum and only have a small space to call our own. Our baby girl is due in a few months so we need to be prepared for her arrival. We may have our own place by the time she comes but we’ve began to prepare a little baby corner in our bedroom just in case! 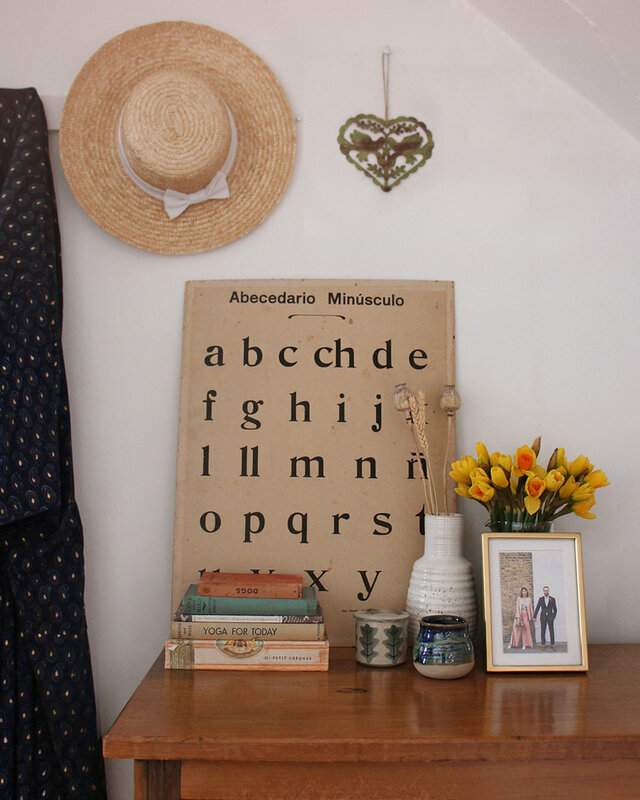 My mum’s house is a tall and narrow Victorian terrace, Simon and I have worked really hard to transform my old teenage room into a space suitable for a little family of three! Luckily we also have my brother’s old room right next door which we’re using as an office and little living room. Our bedroom is in the attic which has really pitched ceilings, this have proven quite a design challenge! It’s lovely to be up in the eaves of the house but it’s equally irritating as it’s so easy to bang your head on the beams! A few years ago my mum painted one wall in my room a lovely soft green which is actually the perfect colour for a bedroom come nursery, it’s so calming. We have a lovely set of antique drawers in the room which will form a great base for a changing station. I wanted to create a quick mock up of what we could do with the space above. Click the links below for the products. As you can see the room has a calming atmosphere and some lovely period features, the perfect place to introduce a few baby essentials. Most of our things are in storage but we chose a few special items from our life in London to have on display. The wicker chair is so comfy and will make a lovely nursing spot. This is the opposite side of the room from the fireplace. If we need to we can turn the top of the drawers into a place to pop changing things and other baby related accessories. I love these drawers so much that I’ve asked my mum if we can have them when we move into our own place. I think the few wooden toys we have as well as the seagrass changing mat will go so well in this little corner. We’ve started buying a few things so I thought it might be useful for you to see what we have or what we will be buying very soon. These items are for our room so don’t include clothes or things for bathing etc. We’ve decided to opt for a moses basket and stand for the sleeping option. We love how they look and they can be transported around easily too. One of my Instagram friends suggested that I buy one of these super handy nappy caddies. Again you can carry them around the house and all the changing stuff is in one place. You’ll need a few blankets, maybe a quilt if it gets cold and lots of swaddles. I have this stunning cotton blanket from Little Blue Nest. Even though she’ll be too small to use them for a while I just love wooden toys, this one is for me really! Sarah and Bendrix have a wonderful selection. If you have hard wooden floors or itchy wool carpets like us you may want to get a play mat so you both have somewhere comfortable for tummy time etc. We have this beautiful seagrass changing mat, we may not use it all the time but its a lovely object. We’re also going to buy a roll away mat too which we can use around the house. Storage baskets are a must, I’m sure we’ll end up with baby things all over the place so we have some open containers and some with lids in case we want to hid things. I think some sort of garland, mobile or wall hanging is a really cute and easy way to introduce a bit of baby style to your space. They are some super chic ones available like this one. Your baby will need something to sleep in and the idea of these sleeping bags seem like the easiest option to me. They usually have zips at the bottom for easy nappy changes. We bought a grooming set the other day that has everything you could possibly need in once case, this Sophie la Girafe set looks really cute though! I can’t wait to finish off our little baby corner! I’ll be sharing photos once it’s all done on here and my Instagram. We still have some things to get like newborn clothes etc but It’s all becoming so real now. I can’t believe that our baby will be here in a couple of months. I hope you found this post useful if you have a small space like us.